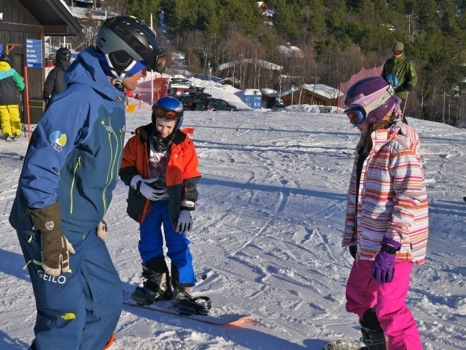 Yesterday we got the kids a private snowboarding lesson as it's so quiet here that there aren't many group lessons going on and none for junior snowboarders. There's no way Jon and I would have been able to teach the children effectively especially as they weren't too keen on the whole thing anyway. And it turned out to be totally worth it. They both really enjoyed it and progressed in leaps and bounds. I should just say that we have now reached the expensive part of our holiday. And given we are holidaying in Norway, that's saying something! As anyone who has ever skied knows, going downhill is like ripping up cash at the best of times, and taking children multiplies that factor. It is still significantly cheaper than the same experience in Australia (for example lift passes are $60 for the day) but it's still roughly the equivalent of withdrawing all our remaining cash, dousing it in petrol and setting it alight! It's all good though - nothing we hadn't planned for or expected. So after the kids had their lessons, Harald took us out for a x-country ski skating lesson which was great - Jon and I at least know what we are supposed to be doing now! yay!